Today I would like to share my testimony of latter-day prophets. As members of The Church of Jesus Christ of Latter-day Saints we are blessed to be led by a living prophet today, President Thomas S. Monson. We are given the same gift as the people of old, a man called of God to guide this church and a direct mouthpiece of the Lord. I sustain him with all of my heart, along with our counselors of the first presidency and quorum of the 12 apostles. I am so excited for this upcoming weekend of general conference, a semiannual worldwide gathering in which Church members and others meet to receive inspiration and instruction from church leaders. The conference is recorded so everyone can watch it live on television or online. Life doesn't have to be a one-way glass mirror window where we are being silently observed, yet feel completely alone. Our lives are sprinkled with little glimpses into what lies behind that sheet of glass separating us from our Father in Heaven. We are given scriptures, prayer and personal revelation, priesthood blessings, and our loving prophet and apostles to lead and guide us. 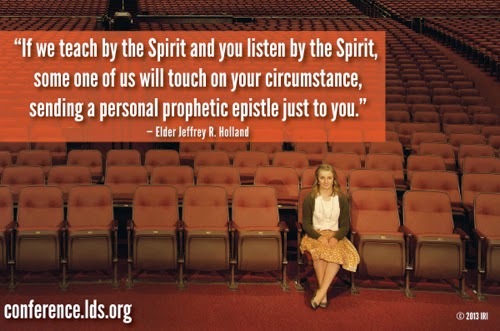 General conference is a beautiful opportunity for each of us to ponder and pray and to receive inspiration from the speakers to guide us in our personal struggles. I am so grateful to live HERE, NOW, in THIS time and age where we have a prophet to follow. I'm thankful for a loving Heavenly Father who is there watching over us, and if we observe closely, he can touch our spirits through the gifts of revelation he has hidden in our lives. I invite EVERYONE, church member or not, to take part in this fantastic event and listen to the prophet's voice this weekend during general conference. To watch general conference online you can click here.